After 3 days and 32 hours of driving I finally made it to California! Throughout the drive I saw mountains, desert, tumbleweeds, huge trees, forests, and corn. A little bit of everything. After a few days of being in the car, my dad and I were ready for a good meal. He has been to Northern California many times so on our way in we decided to go towards Napa. The views were absolutely amazing. I have been here less than 24 hours and I am already in love. To get a good meal we drove into St. Helena to Long Meadow Ranch. They have vineyards and a vegetable garden and sell wine and olive oil on their property. 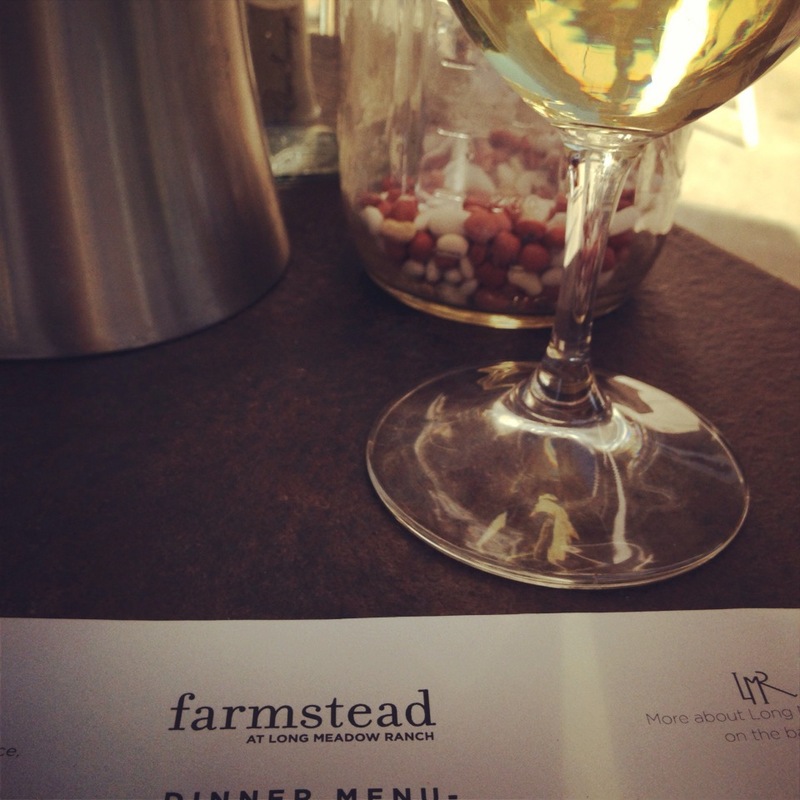 They also have a restaurant called Farmstead. We arrived at 6pm on a Saturday night so it was busy. We sat outside on their patio and it was absolute perfection. Between the lovely warm sun and the energy of everyone there I was one happy camper. For dinner I ordered their grilled salmon that was on special that night. I love fish, but I'm not a huge salmon person. After 3 days of fast food I was ready for something lighter so I decided to order it. 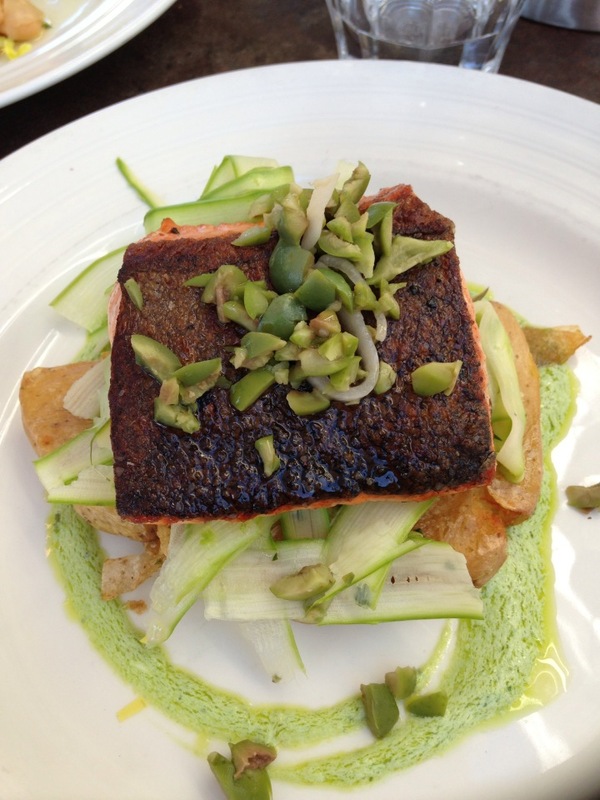 It came on a bed of fingerling potatoes and shaved asparagus with a citrus vinaigrette. Around the salmon was a green garlic creme fraiche. I devoured the entire thing. We had ordered an appetizer, but they forgot to deliver it to us and we got a free dessert. 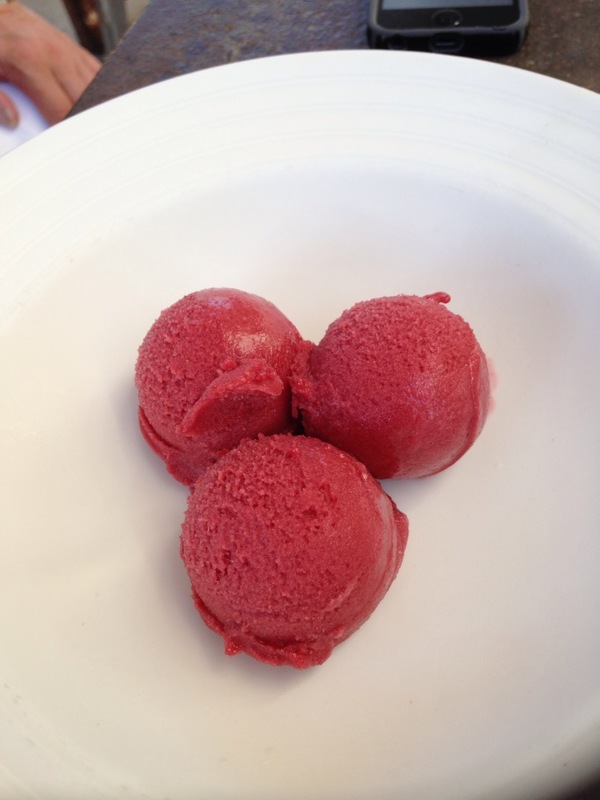 I chose their seasonal sorbet which was strawberry peach, made with fresh fruit from the Ranch. It was sweet, but with a licorice-y after taste. Overall, very good. For wine, we shared a bottle of Franciscan Cuvee Sauvage Chardonnay 2011. It has a very earthy taste because it is fermented with wild yeast. It was the perfect meal to start my summer in California.